Collins Booksellers - A Handbook of Writing Activities For Intermediate and Advanced English Language Learners by Felipe Cofreros, Ph.D., 9781503548152. Buy this book online. This book "A Handbook of Writing Activities for Intermediate and Advanced English Language Learners" comprises varied learning opportunities rich in teaching grammatical aspects, a language topic rarely discussed in many English handbooks, which refers to the teaching of low action words happen whether bounded, habitual, or continuing. Moreover, interesting topics perceived to be of interest to students are included to keep the exercises left undone once they started the tasks. Its excellent format from simple to complex will give learners confidence to enjoy the activities. Like wise, with the controlled, semi-controlled, and open-ended exercises which could be done without the teachers's assistance, all will lead students to realize that writing after all is lots of fun. Of course subject of interest have been carefully considered to suit the English Language Learners' needs. Indeed, all materials and activities in this piece of work have been thoroughly designed for intermediate and advanced levels particularly those who study English as a Second Language [ESL]. 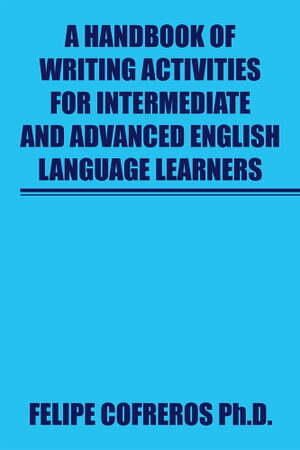 Without any qualms this Handbook of Writing Activities for Intermediate and Advanced English Language Learners will definitely be useful for English as a Second Language [ESL] students and teachers.